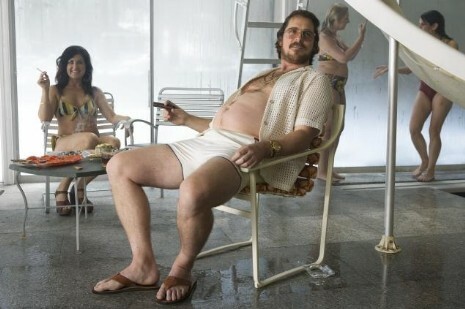 Having recently seen Christian Bale looking gaunt in “Out of the Furnace,” we were floored by this photo of him in his soon to be released movie “American Hustle.” In two months he ate enough cheeseburgers to gain forty pounds. That, and shaving off his hair into a greasy comb-over, turned him into a very unappealing 1970’s con-man. Ever since Robert De Niro gained all that weight to play Jake La Motta in “Raging Bull,” younger actors have been following in his footsteps, with visions of Oscars dancing in their heads. Somehow we can’t picture Brad Pitt ever doing that.